Some time ago (2009-ish…) Dave asked if I could do a blog post for him. Well, I finally got around to doing that. So I decided to go out on a limb and write something about Tyrannosaurus rex. For those who know me, there is no surprise that I am interested in tyrannosaurids. (Heck, I am in the midst of writing a kids book on T. rex for Random House.) I am hardly alone in this: tyrannosaurids in general, and T. rex in particular, are extraordinarily well-known to the public, and especially to the news media. In fact, as has been mentioned here and elsewhere in the blogosphere, T. rex has somehow become the measure of all things theropodan (or dinosaurian, or even just paleontological!) So when the alvarezsaurid Linhenykus was first reported, the press called it “a one-fingered T. rex relative” or a “T. rex cousin”: yes, true, but far more closely related to (among other critters) Velociraptor. [Dave ads: I was of course associated with that research and did my best to excise this reference from our dealings with the meida – I failed]. Same for the basal theropod Eodromaeus, or pliosaurs, or even the stem-arthropod Hurdia. Yes, Tyrannosaurus rex is a wonderful animal. And in some situations (for example, when discussing new tyrannosauroids like Zhuchentyrannus or Bistahieversor, or Xiongguanlong) it is very appropriate to tie these new discoveries in to their better known close relative as a way of helping the public understand them. But if people keep on automatically defaulting to use the phrase “T. rex cousin” or “T. rex of the [fill in the blank]”, they will lose sight of why Tyrannosaurus is as interesting an organism to study as it is. And that would be a shame, because there are many wonderful things about this species that make it a great subject of scientific research. Tyrannosaurids have incisor-like teeth: In nearly all other theropods the premaxillary teeth (the front of the upper jaw) are grossly similar to those in the maxillae and the dentaries. Yes, they may be smaller (although not necessarily) and are often more asymmetrical than the main teeth, but they are still roughly similar. Not so with tyrannosaurids. Indeed, tyrannosaurid premaxillary teeth are so weird that for awhile O.C. Marsh considered some of these (under the genus name Aublysodon) to be those of Cretaceous mammals of unprecedented size! As many readers here know, tyrannosaurid maxillary teeth have a cross-section something like a capital U, with the rounded part facing forward, and the tips of the “U” (representing the carinae, or rows of serrations) facing tongueward. Furthermore, tyrannosaurids are peculiar with their premaxillary teeth lined up in a row left-to-right. This is different than practically all other theropods, in which the premaxillary teeth for a diagonal curving backward, so that the last premaxillary tooth is well posterior to the first (middlemost) one. This whole arrangement gives tyrannosaurids a “scraper” in the front of the jaws, very different from the arrangement of teeth behind. As shown by Hone and Watabe there is trace fossil evidence that tyrannosaurids were capable of several different sorts of feeding and food manipulation, for which the very different styles of dentition would be adapted. The rest of their teeth aren’t “normal”, either: At least where “normal” is defined as “ziphodont”: flat-sided, blade-like teeth with serrations lined up the front and down the back, and a root which is just about the same height as crown. This sort of tooth is primitive for theropods, found in forms as diverse as Herrerasaurus, Ceratosaurus, Carcharodontosaurus, and Velociraptor. In marked contrast, the anterior lateral teeth of tyrannosaurids are what I (and others) have termed “knife-edged bananas”: mediolaterally thick, very deeply rooted, with asymmetrically-oriented carinae. Behind these teeth are smaller, blunter teeth that are about as close as tyrannosaurid dentition gets to the ancestral form (see Jamie Headden’s review here). And tyrannosaurid teeth are freaking enormous, especially in Tyrannosaurus rex itself. Part of that is due to the deep roots, but even the crowns are quite long. As a consequence, any individual lateral tooth takes up more space in the gumline of Tyrannosaurus than a tooth in (for example) Gorgosaurus or Allosaurus. Amusingly (well, at least to me), the fact that Tyrannosaurus is highly specialized in having giant sized teeth smashed into the media’s use of T. rex as the measure of all things in news reports on the naming of Bistahieversor. The headlines sometimes emphasized “New tyrannosaur had MORE TEETH than T. rex!” Well, yes. So does Velociraptor. And Allosaurus. And Tawa. And, well, pretty much all theropods other than ornithomimids, caenagnathoids, and toothless birds. Tyrannosaurids have broad snouts and wide backs of their heads, and T. rex more than most: Most big theropods have “hatchet-heads”: narrow mediolaterally, deep dorsoventrally, with relatively parallel sides of the skull. Technically termed “oreinirostral”, this skull form is fairly rare in the modern world, but has been much more common in the pre-Cenozoic: present not only in typical theropods, but also carnivorous terrestrial crurotarsans, predatory basal synapsids, and so forth. Tyrannosaurids are, once again, weird, and Tyrannosaurus the most extreme of the clade. The snout itself has a more rounded cross-section (which is also present in abelisaurids, for instance), and is particularly broader across than in a comparable-sized allosauroid. And the posterior portion of the skull flares out mediolaterally, more so in T. rex than in the rest of the clade. Among other things, this increases the volume of the jaw-closing muscles; increases the size of the neck muscles (as shown by Snively and Russell); and provides for greater possibility of binocular vision than in other large-bodied theropods (as discussed by Kent Stevens). Tyrannosaurids have big brains (for a large theropod), big olfactory bulbs, and a great sense of balance: Thanks to various teams of paleontologists armed with CT scans and visualization software (and extra special thanks to the Witmer Lab), we have a far better understanding of the insides of T. rex’s head now than just a few years ago. Among other things the scans of the brain cavity and associated structures of T. rex reveal are: that tyrannosaurids have larger brain size than other comparably-sized theropods, an aspect of their coelurosaurian ancestry retained after they evolved giant size; that the olfactory bulbs of tyrannosaurids are disproportionately larger than those of all other studied carnivorous dinosaurs of the Mesozoic, with the exception of the dromaeosaurids; and that the relative size of the semicircular canals (the organs of equilibrium) in tyrannosaurids indicate that they were highly sensitive to rapid movements of the head, again a trait inherited from their smaller ancestors. Tyrannosaurids have really, really reduced arms: And not just short. After all, even carcharodontosaurids have short arms. Tyrannosaurid arms are short, slender, and rather short in the digit count. Tyrannosaurids have HUGE hips: In contrast, the hind limbs of tyrannosaurids are very well developed. One of the lesser appreciated aspects of tyrant dinosaurs is how big (relatively thinking) their pelves are, and in particular their ilium and its associated muscles. If you look at skeletons of other larger-bodied theropods, such as Acrocanthosaurus and Giganotosaurus and Carnotaurus and compare that to Tyrannosaurus you’ll find that the ilium occupies less space anteroposteriorly and dorsoventrally in the non-tyrants. Furthermore, unlike in most other large theropods the ilia of tyrannosaurids converge towards the midline, so that the muscles occupied an even greater volume (relative to body size) than the lateral view might suggest. Tyrannosaurid feet are awesome: The other end of the hind limb is also very derived in tyrannosaurids. 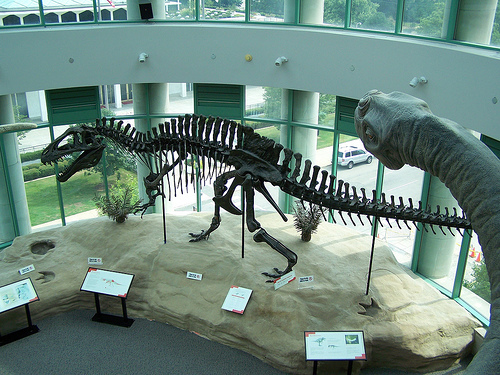 Tyrants differ from typical large-bodied theropods in the possession of an arctometatarsus (“compressed metatarsus”), where the middle long bone of the foot is compressed between the other two main weight-bearing bones. As described by me some time ago, and subsequently explored in greater detail by Eric Snively and colleagues, this adaptation seems to represent a functional adaptation towards enhanced cursorial (running) ability. While this does not mean that a fully grown 8 ton (or more) Tyrannosaurus rex was as fast as a racehorse, it does suggest that it was faster and more agile than other similar-sized animals (such as hadrosaurids and ceratopsids) that lack comparable speed adaptations. Furthermore, a juvenile T. rex might have been a very swift animal indeed. This covers some of the physical attributes of the tyrant king that make it an interesting animal. However, there is more about T. rex than its anatomy that make it a wonderful study subject. More about that later. Awesome. I’m looking forward to more! Excellent post. I wish dinosaur books had such detail descriptions on Tyrannosaurus as your post did. And thank you so much for that Tarbosaurus skull photo. I love photos with an actual man next to it for size comparisons. Just a few questions. Is that the skull of the holotype PIN-551 (or whatever the numbers were)? If so, why is it that throughout the 80’s and early 90’s I keep reading about Tarbosaurus being slightly smaller than T.rex when in fact it was basically the same size? The holotype was huge. Sure it can’t compare with FMNH PR 2081, but it was definitely a 12 meter giant, yet I’ve seen numbers as low as 9 meters for Tarbosaurus. It’s only within this decade that books and other media started listing Tarbo at 12 meters. Oh god, so much stuff I left out. 1. Dr. Holtz, will you be addressing the recent study on the size of the caudofemoralis muscle and how fast you think a fully grown adult T.rex could run at? 2. Your thoughts on “Tyrannosaurus X”? 3. Will you talk about Tarbosaurus what the differences between it and T.rex? I remember for a time in the early 90’s, Tarbosaurus became Tyrannosaurus. What are the anatomical differences that separates the two? I know the head isn’t as wide for one thing, but outside of that, I don’t know. That’s a pretty big tarbosaur skull you’re standing next to Dr. Holtz =O either that or its a T-rex. Great first post! Looking fwd to the rest. Loved your book too. 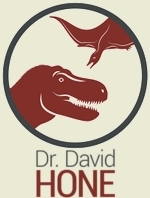 It would have been great with just the text from all of the various subject experts, but the inclusion of so much of Luis’ fantastic vibrant artwork makes it one of my favourite books (not just dino/palaeo). I used to be not a fan of T. rex and co. because pretty much everyone else seemed to be. Deinonychus was the one I liked most until I found out about Baryonyx. Then I read Jack Horner’s The Complete T. Rex [everyone spells the title with a capital ‘R’] and I was enlightened regarding their majestic beauty. Now I prob like T. rex as much as the next Jurassic Park fan, but for slightly different reasons. They really do appear to be highly adapted and at the peak of an evolutionary lineage, and are quite unlike other large theropods. That is NOT the type of T. bataar, although I did get a chance to study it when it was in the US back in the 1990s. 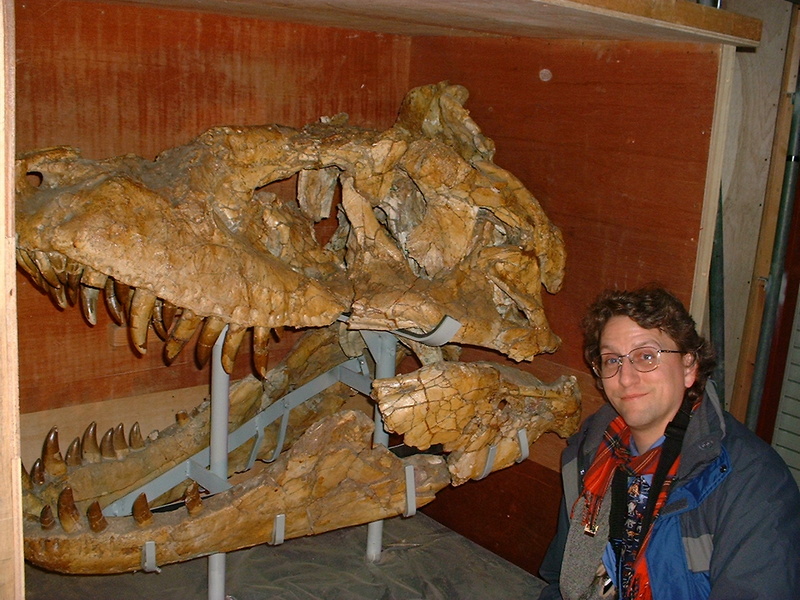 This specimen I am next to is privately owned in Japan: the skull is about 1.2 m long the whole individual is only about 9.5 m total. Yes, the holotype of T. bataar is huge, but even in the 1980s there were partial T. rex specimens which were clearly bigger. However, had Tyrannosaurus never been discovered, Tarbosaurus would have been our largest theropod known from good fossil for a long time. I will talk about the new size and growth studies. I am unconvinced by “T. X”: there are many sources of variation that have to be considered (sexual, ontogenetic, regional, stratigraphic, and good old fashioned individual!) before the assertion of a new species can be accepted. I didn’t plan on discussing the distinction between the two, but Tarbo. has an even more-reduced forearm and metacarpal III than other tyrannosaurids, a different morphology of the posterior ilium, and certain cranial features. Assuming (as most analyses show) that Tarbosaurus and Tyrannosaurus (and now probably Zhuchengtyrannus) are sister taxa, it actually be perfectly reasonable to lump them all together. However, there was a time when the relative positions of the various tyrannosaurines (these guys plus Daspletosaurus and Alioramus) was uncertain, so it was safer to keep Tarbo. separate. I see I see. Thanks for answering the slew of questions. Are there photos of the holotype Tarbo anywhere? I’ve always been curious to see what it looks like. I had a picture up on the Tree of Life page on Tyrannosauridae, but the ToL project is phasing out and I can’t load it. I found a smaller picture of it here. Oh, really? I’d not heard that — and there is certainly nothing to that effect at http://tolweb.org/tree/home.pages/news.html although I suppose the lack of ANY news newer than February 2009 tells its own story. The Encyclopedia of Life project has been ramping up, taking up more time and resources from the ToL (since most of the systemicists involved in one are also involved in the other). So ToL seems to be on hiatus (at least) as EoL grows. Thanks everybody for digging out those pictures. I’ve seen those pictures before, but never knew they were from the holotype. Now I know. But man, a 1.2 meter skull for a 9.5 meter animal is very impressive. I’m sorry, Tom, but I don’t think your post will do anything to quell the hype (more’s the pity 😉 ). …Cretaceous mammals of unprecedented size? I don’t believe they exist. Cracking post, more soon please!